About the cycle of Age's, or precession of the equinoxes, the slow change in the orientation of the earth's axis of rotation, during this rotation the axis moves through each astrological Age, the complete cycle is the subject of disagreement among experts figures very from 21,900 to 26,000 years, a 24,000 year cycle has been used as this makes easy understanding and fits in with mythological time tables. 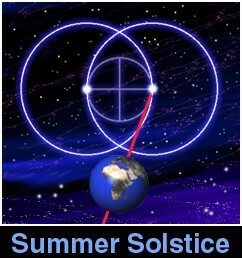 The Vesica Piscis represents the summer and winter solstices of this cycle. The Vesica Piscis, or cycle of Age's, or precession, occupies the northern hemisphere and is not to be mistaken for the yearly cycle of the zodiac which occupies the southern hemisphere, when observed from Stonehenge, 51 degrees north of the equator. The Vesica Piscis, Vesica, Cross and Circle are used separately and form symbols that stand alone. The Vesica Piscis consists of two overlapping circles, examples can be found in Glastonbury gardens and the lid on Chalice well, which is a particular good example as it contains the meridian line that runs through the centre of both circles. The Vesica in the form of doors and windows can be found in Churches, Mosques, Pagodas, Tabernacle's and Temples world wide. The Cross and Circle in the form of the Celtic Cross and Sun Wheel, can be found almost anywhere, these symbols date back several thousand years. All three symbols together form the key. This cycle is more of a cosmic clock, a measurement of time that reflects the changing seasons of the yearly cycle, but on a much larger scale. 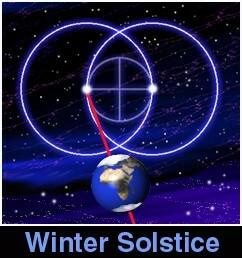 Winter Solstice The winter solstice of the cycle of Age's takes place in the year 10,000 BC, the beginning of the Age Leo. At this time the earth's axis of rotation is pointing at the pole star Vega, The circle on the left represents the path followed by Polaris due to the rotation of the celestial sphere. The two position's of the earth's axis through six Age's, from the beginning of Aquarius to the beginning of Leo takes about 12,000 years, as the axis moves it traces out 180 degrees of a circle from Polaris to Vega, and will take 12,000 years to return to Polaris completing 360 degrees of a circle. Aquarius is the first Age of a new cycle of Age's. 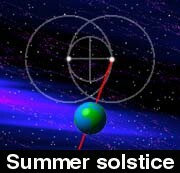 Summer Solstice The summer solstice of the cycle of Age's takes place in the year 2,000 AD, the beginning of the Age Aquarius. 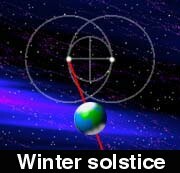 At this time the earth's axis of rotation is pointing at the pole star Polaris, The circle on the right represents the path followed by Vega due to the rotation of the celestial sphere. The smaller circle in the center of the Vesica Piscis symbol represents the path followed by the celestial axis over a period of 24,000 years. The cross represents the four cardinal points (cardinal cross) and marks the solstices and equinoxes of this cycle. The Vesica occupies the space between the two overlapping circles that form the Vesica Piscis symbol. Precession This precession courses the celestial pole to trace out a cone round a central axis, of which the earth's axis is at a 23.5 degree angle to. As the celestial pole moves round this axis, the celestial equator moves relative to the ecliptic, the points of intersection of these two circles, the equinoxes, move along the ecliptic from Age to Age, about 1 degree every 67 years. The slow change in the orientation of the earth's axis of rotation courses the sun to rise with a different constellation on the vernal equinox every 2,000 years, what this means is, on the vernal equinox of the yearly cycle of the zodiac in the Age of Aries, the sun rises with Aries as backdrop, in the Age of Pisces, with Pisces as a backdrop, in the Age Aquarius with Aquarius as a backdrop and so on. for the past 2,000 years the sun has been rising with Pisces as a backdrop, in the next 2,000 years the sun will be rising with Aquarius, hence, the new Age of Aquarius. The spring equinox of this cycle, 4,000 BC, the cusp of Gemini and Taurus, and the beginning of the Age Taurus, as this cycle revolves the opposite way to that of the yearly cycle of the zodiac. The Age of the bull and bull worship. The Apis Bull was an incarnation of the God Ptah of Memphis, a statue of which was found at the Serapeum at Sakkara. The Cow of Hathor from the temple of Hatshepsut, Deir el-Bahari. The great winged bulls found in Nineveh, these bulls weighed fifty tons each and date back to the Age of Taurus. 2,000 BC, and lam worship in the form of the sacrificial lam of Abraham, Sacrifice of the lam on alters began with Abraham in accordance with the ruling sign in heaven, as above so below, this is because the constellation Taurus no longer rose with the sun on the spring equinox, the constellation Aries did. Old symbols of the bull are replaced with the ram under the rule of Rameses, the avenue of rams leading up to the great temple of Amun at Karnak date back to the Age of Aries. festivals in ancient times. In Christian ritual the Easter celebrations took their place. Easter being fixed with reference to the day when the sun enters the constellation of Pisces. Vesica Piscis (Lit.= the fish's bladder.) a term employed to designate the elliptic Vesica in which the Saviour is depicted, it is formed of two equal circles cutting each other in their centres, the term is derived from the sacred character of a fish as a symbol of Our Lord. The seals of abbeys, colleges, and other religious establishments were invariably made in this form (ref, Lloyd's Encyclopaedic Dictionary) Unlike previous Age's as above so below only applied for about 300 years, between the years 300 to 350 AD, the fish and Vesica Piscis, symbols of early Christianity, were replaced in importance with the cross in the form of the crucifix. The symbol of the lam from the past Age of Abraham also replaced the fish in importance. The Age of Pisces was replaced with the past Age of Aries, two Age's of Aries, the second over the Age of Pisces, from this point onwards a separation between heaven and earth began, and the science of astrology split into two directions, one became the astrology of today, the other astronomy, this is because the results from tools used, like theodolite's or astrolabe's to measure the planets positions no longer matched there positions in heaven that astrology claimed. For the past 2,000 years on the spring equinox, the sun has been rising in Pisces not Aries as claimed by today's astrology, at present the sun is rising on the cusp of Pisces and Aquarius the summer solstice of this cycle, and is about to move into the Age of Aquarius where it will stay for the next 2,000 years. The Age of Aquarius 2,000 AD. This Age begins with a global rise in temperature, melting ice caps, a rise in sea levels causing flooding of low lying land, changes in weather patterns and sea currents, storms and heavier downpours coursing localised flooding. The surface of the earth is covered by more water in this Age than in any other, the least amount of water coverage being around the winter solstice of this cycle as large amounts of water is held in vast ice caps that form around this time. This is a vast subject that has just been touched upon. The eye in the Pyramid. The Pyramid seen as a theodolite for measuring the summer and winter solstices of this cycle. Those interested in the Vesica Piscis may have more of an insight into it's astrological meaning.